Chopin's mazurkas are usually numbered up to 51, but some recent catalogs now assign a number to the early ones. Previously this B flat major effort was identified merely by the Maurice Brown cataloging of B. 16. 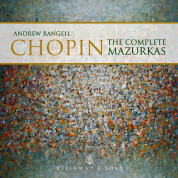 Most of Chopin's early mazurkas were published posthumously and not intended by him to see print. However, he did get this B flat major effort, along with its sibling, the G major mazurka, published in Warsaw in 1826. While many may regard this piece as a questionable effort, it offers more than a few virtues. One immediately notices its lightness and charm, its chipper manner and infectious jauntiness. It also has melodic appeal, even if it is a bit superficial and without depth. But at least its thematic wares took roots in a later Chopin work: there is a strong resemblance between this B flat major's main theme and the second theme presented in the Mazurka No. 45, in A minor, which has a more serious character and, it must be conceded, is better constructed. This early mazurka lasts just under a minute-and-a-half in a typical performance.